Combine all the ingredients for the dry rub in a small mixing bowl. Rub the ribs with the dry rub. Wrap in plastic wrap and let marinate in refrigerator for 8 hours or overnight. 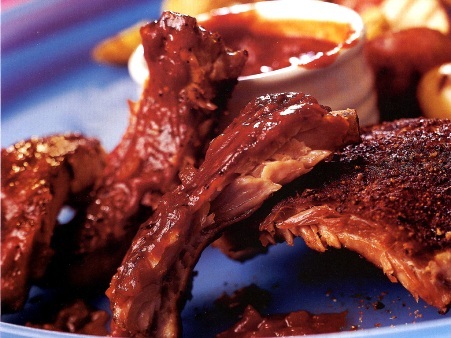 Place ribs on a large baking sheet lined with aluminum foil. Cover tightly with foil and place in middle rack of oven. Let roast for 2 1/2 hours. Add all the ingredients to a medium saucepan. Bring to a boil then reduce to a low simmer. Let simmer for 25 minutes, on low heat, stirring occasionally. Take ribs out of the oven and place on grill to finish. Cook for 20 more minutes, turning and basting with sauce. Remove from grill and serve as either racks or cut into ribs.